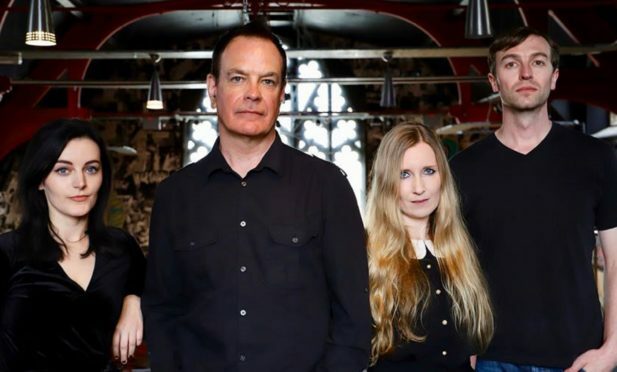 The Wedding Present with David Gedge, second left. “I remember the last concert we played in Dundee at the Reading Rooms about 2005, because a girl got on stage and started dancing,” he laughs. The Weddoes kicked off their Bizarro celebration with a batch of English shows last week and Dundee opens the second leg of a 12-part itinerary running through to December. “Rather than do a tour we thought we’d scatter them through the year and there’s a lot of advantages to it,” says David, 58. It was after being talked into a 20th anniversary tour of their 1987 indie debut George Best that David softened on the idea of reconnecting live with his previous works. “When an album first comes out you never hear it all, you hear a few tracks off it but never the entire thing,” he explains. “People get attached to it so it’s interesting to go back and hear it live, so I thought we’d try it with George Best and it’s the same with Bizarro. To be honest I was taken aback because I did find it interesting. It’s a different line-up now and it was interesting to see how they reinterpreted this album — it’s like cover versions almost. “There was a sense of nostalgia for me because it’s like reading an old diary. Those songs are very personal and I kind of go back and suddenly there I am 30 years ago thinking those thoughts that led to the songs. That’s how I came to the philosophical decision that maybe the past is as important as the future and the present. The Hove-based songsmith says he relishes firing out Bizarro’s wall of sound in the live arena. “Take Me! is always a fun song because it’s nine minutes long and it’s quite aggressive — it’s a bit of a workout really,” he quips. Tickets £24 from Grouchos in Dundee, seetickets.com and Tickets Scotland. Dundee post-punk exponents Stoor unveil their second album at Beat Generator tomorrow. The hard-gigging outfit — Stef Murray (vocals/bass), Scott McKinlay (drums) and guitarists Ross Matheson and Davie Young — provided a glimpse of the new set in the shape of download track Atrocities earlier this month. The LP, Fleam, is available on both black and white vinyl plus CD, download and streaming formats. Cool Cat Club gig tickets are £6.60 from Grouchos or WeGotTickets. It’s tribute outfit Mama Genesis (tonight and tomorrow) and AC/DC pastiche Hells Bells (Sunday, 2.30pm) at Kinross’s Green Hotel this weekend. Tickets via TicketWeb. There’s a Westfest/EH6 band battle at Church tonight with locals Boyz Who Bruise and The Marx among those in action. Pete Smith, Killjoy and Perth’s hvsk compete tomorrow. Tickets £5.50. Kelty R’n’B veterans Baby Isaac play Clarks on Sunday (3pm). Tickets £5.92 via Eventbrite, Grouchos and Assai. Scots alt-rockers Aboriginals hit Conroy’s on Sunday. Tickets via Eventbrite. Number 57 has sets from Independence, The Sixties (both tomorrow) and Tivvy (Sunday). Courier Country bluesmen Wolftrain are at Westport Bar tomorrow. Cherry Bombz’ weekend blitz takes in Campbeltown Bar, Clarks and Harlequins.